All kids big and small are enjoying the season. The perfect Saturday afternoon was on Thursday this year for the annual Castle Pines Chamber of Commerce golf tournament at the Ridge. Yes it rained but no one seemed to mind. If it's September in the City of Castle Pines, then it's time for food trucks, beer, music, zorbee balls & fireworks. We thank our sponsors for all they contribute to our community! The Castle Pines Connection, City of Castle Pines, Castle Pines North Master Association, Castle Pines North Metropolitan District, Douglas County Libraries, Spector-Dodd & Associates, Christian Brothers Automotive, Castle Pines Rotary, Automate Colorado, Colorado Kids Pediatric Dentistry, Mama Lisa’s Little Italy, Lone Tree Symphony Brass Quintet, Castle Pines Athletics, See you next year! On August 23rd The Rotary Club of Castle Pines held their 1st BBQ, Brews and Banjos in Larkspur to benefit Douglas County Youth. Animal lovers from all over the Denver and Castle Pines area congregate each year at the beautiful Castle Pines Village (CPV) home of Jana and Fred Bartlit for their annual Lulu’s Barkin’ BBQ. In it’s fourteenth year, the fundraiser benefits the programs and services offered to homeless animals at the Dumb Friends League (DFL) Buddy Center and the DFL Harmony Equine Center. Crowds of nostalgic car buffs rocked out to groovy tunes of The Fabulous Parker Brothers as they made their way though the rows of beautifully restored classic cars at the seventh annual “Hot Rods in the Village” car show sponsored by the Vintage Car Club of Castle Rock. School may be back in session, but summer isn’t over yet! Castle Pines Village (CPV) residents celebrated going back to school with a kid’s carnival at the Summit Club and a pool party at the Canyon Club on a gorgeous day in August. Both parties were hosted by the CPV Parks and Recreation Committee and hundreds of kids and their parents came out to celebrate. The kid’s carnival attendees played in the jumpy houses, snacked on popcorn and popsicles, had their faces painted and played games and swam. Those at the pool party enjoyed music from a DJ and snacked on frozen treats. A good time was enjoyed by all! A beautiful and unseasonably cool day graced this years 4th of July celebration in Castle Pines as friends and neighbors enjoyed the parade, the music, and the barbecue. The best way to start the summer is with friends and neighbors at the HOA#1 annual pool party! The Castle Pines Chamber of Commerce along with several local businesses brought a fun evening of family entertainment to Elk Ridge Park. We want to thank all of our wonderful sponsors, The Castle Pines Connection, Big O Castle Pines, The City of Castle Pines, Douglas County Libraries, Camp Bow Wow, Castle Rock Adventist Hospital, Castle Rock Bank, Infinity Roofing & Siding, Asarch Center, Allstate - Tammy Lopez, Castle Pines Orthodontics, and Berkshire Hathaway Home Services. For the last quarter century the Community Wide Garage Sale has been a rite of Spring. The shop owners at The Village at Castle Pines (VACP) kicked off spring in a big way with their first annual “Spring Fling” event on April 25th. Hundreds of neighbors and friends came together to celebrate on a typical Colorado spring day that brought both sunshine and afternoon rain. 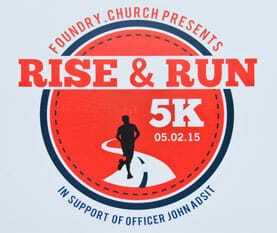 Hundreds of well wishers cheered the participants of Foundry Church's Rise & Run 5K as the runners made their way through the streets of Castle Pines in support of Officer John Adsit and his family. Rain or shine, this time it was rain, the DVD and book swap is always a community favorite event. Dancing between snow storms was the perfect Saturday for an Easter egg hunt! After a two-year hiatus, Solid Life Church treated the kids, big and small, to a fantastic afternoon at Coyote Ridge Park. Included are additional photos from the Surrey Ridge and Castle Pines Village Easter egg hunts. The theme of this years chamber banquet was Under the Big Top, held at the magnificent Cielo at Castle Pines. Congratulations to all the award winners and a hardy thank you to all the volunteers! Women Inspired Together (WIT) kicked off 2015 with an amazing event that brought eighty local women together for a full day of inspiration, laughter, good food, and sharing. The Canyon Crew shot past the Harlem Wizards as basketball fans roared with laughter during the Crew vs. Wizards face-off at Rock Canyon High School. With fantastic antics, dynamic dribbling, and awesome alley-oops, both teams ran, jumped, and even rolled on the ground impressing a full-house crowd. Hot chili and hot sunshine made for a cool day! 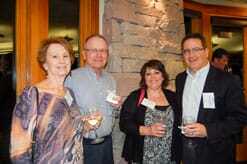 New residents of Castle Pines Village (CPV) thoroughly enjoyed themselves at the reception held in February in their honor by the CPV Welcome Group. The beautiful Country Club at Castle Pines was the venue for this quarterly event, which is the perfect way for new residents to learn more about their new community and to make contact with neighbors.